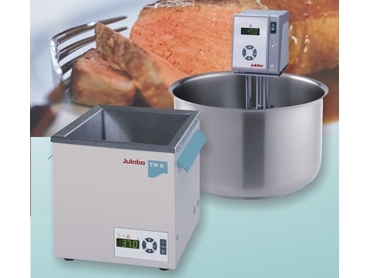 Julabo have a range of product solutions for Sous-Vide cooking, including heating circulators and refrigerated/heating circulators, that are ideally suited for both of this technique's cooking styles. Sous-Vide cooking was originally developed in the kitchen of George Pralus in 1974 and when translated means 'under vacuum'. His first application was a terrine of foie gras, but today the technique of Sous-Vide is used to create exciting textures and flavours by sealing ingredients in a plastic bag, under vacuum, and then cooking slowly at temperatures well below boiling point. Another style is Sous-Vide storage, or cook & chill. This method is becoming more widely used to cook gourmet meals and then to rapidly cool them. Before serving, the foods are heated in the original bags, producing gourmet meals with a significantly increased shelf life without any loss of texture or taste. Julabo products are easy to use and safe. Two independent temperature sensors ensure the safety temperature settings are never exceeded. The design is robust and allows for convenient transport. Practical accessories like temperature sondes and special puncture seals complete the product range. Julabo products are available in Australia from John Morris Scientific .